Look for inspiration. Find people who are doing what you want to be doing. Ask yourself: What do you like about their work? What do they do differently? How can you learn from them? They might never write a book or teach a course–they might not even recognize that what they do is worth teaching others–but you can still learn from their example. You can learn by watching them, and you can even reach out and talk to them. Review your work. Try to find examples where you’ve already done what you want to do, even if it was by accident. Ask yourself: What did you do well? What did you like about it? What was different? What can you improve on next time? 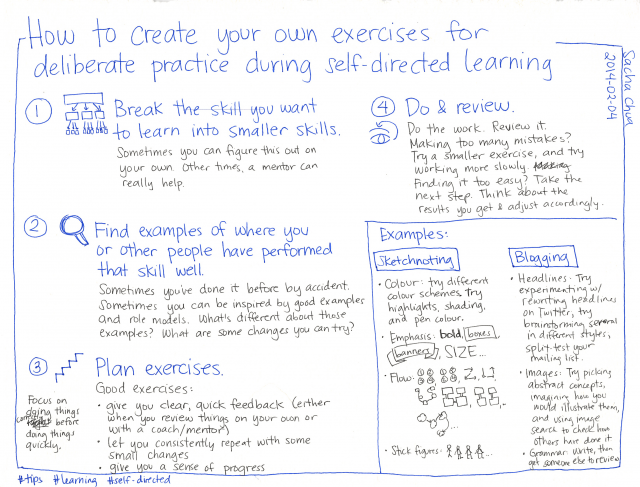 Look for ways to deliberately practise the skills you want to develop. Make your own maps. If you’re learning about something that doesn’t have a clear outline or curriculum, it’s easy to feel scattered and discouraged. Make your own map. List your questions, and keep track of your progress as you answer them. Figure out what the next steps are. 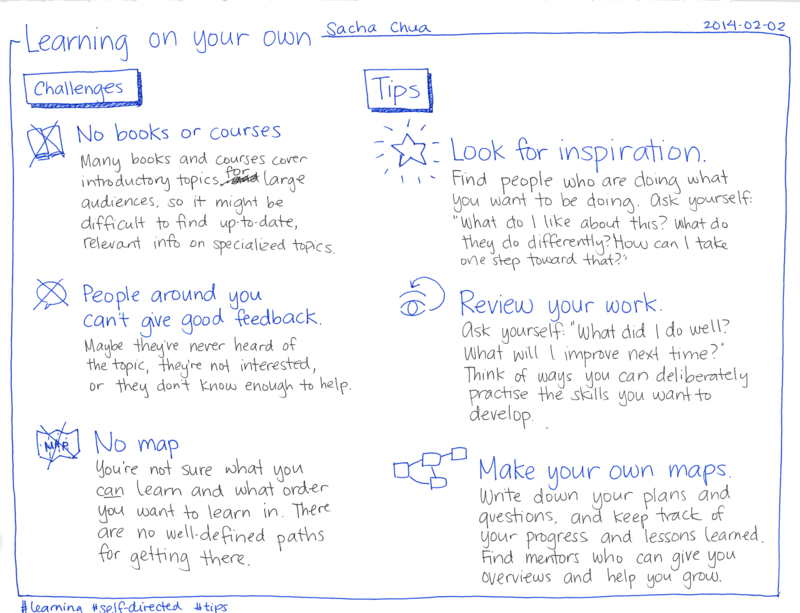 You might be able to ask mentors to help you make a better map. Mentors can tell you if there are easier ways to learn something, or if there are related topics that you would find useful. Make your own curriculum so that you don’t feel lost. 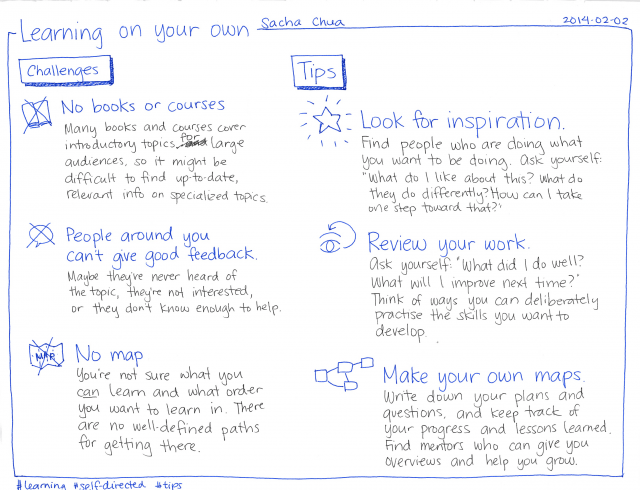 If you’re learning about things on your own, you’ll probably need to come up with your own ways to practise what you’re learning so that it becomes part of the way you work. Instead of being intimidated by the size of what you want to learn, break it down into smaller skills that you can practise. Look for ways that you or other people have done it well, and plan your own exercises so that you can learn how to do well consistently. Deliberate practice is the key towards building confidence and skill. Think about how you can practise that skill in a way that gives you quick feedback on whether you’re doing it right or wrong. You might be able to check your work on your own, or this might be something a coach or mentor can help you with. Keep track of how you do on these exercises – it’s great to feel your progress. If you’re having a hard time with the exercise you’ve come up with, break it down into smaller pieces and try working more slowly. Improve your accuracy and consistency before you improve your speed. If you find the exercise too easy, take the next step. Think about the results you’re getting and adjust the way you practice. Good luck!